Billy Blanks and Roddy Piper star in a lively and enjoyable action thriller. GMVS UK R0 DVD. 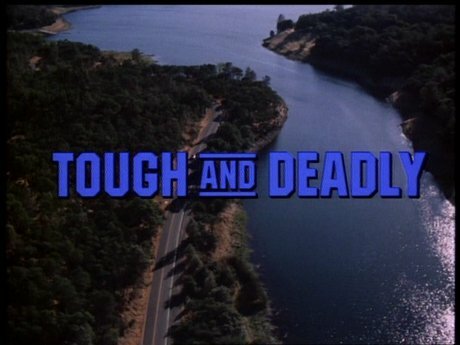 Firmly located in classic buddy movie territory, Tough and Deadly is an excellently entertaining bit of straight-to-video action - the storyline is hardly original but the writers know exactly what fans want and provide fight scenes, both with martial arts and guns, on a frequent basis. The plot is detailed enough to keep things moving and interesting without getting too bogged down in the details. The buddy sequences between John and Elmo are surprisingly enjoyable even if they do fall back onto the typical genre clichés (even down to the fighting over whether to listen to rap or country music) and the film is often quite light hearted, without ever descending into all-out comedy. Pacing is strong to the fitting, if rather predictable ending. Director Steve Cohen does similar work behind the camera as he did on the script - hardly revolutionary but certainly a step above the generic level of so many other DTV action films. The fight scenes are well choreographed and allowed plenty of screentime without the rapid-fire editing of so many more recent films - in the uncut print they are surprisingly brutal in places. A varied soundtrack ranges from rather menacing opening music to some more lively numbers during the action scenes, it all fits well. Pro-wrestler 'Rowdy' Roddy Piper is best known for his leading role in They Live (1988) but did appear in a number of other low budget B-movies in the 1980s and 90s, while martial arts champion Billy Blanks is best known for his Tae-bo workout routines and a rather less well known cinematic career. After pairing up in previously in Back in Action (1993), they again make for an enjoyable combination with Piper's brawling style contrasting well with Blanks' karate moves, they also play very well off each other in the buddy scenes to the extent that it is a real pity that no further films were made together. In the rest of the cast, the most recognisable face is veteran actor James Karen (The Return of the Living Dead (1985)) as a CIA director. Fans of the classic 1990s DTV action fare from stars like Seagal or Van Damme will find plenty to enjoy in this action packed buddy thriller with solid performances from Piper and Blanks and scripting and direction that focuses on the all important action scenes. Anyone famous in it? Billy Blanks - creator of the popular Taebo workouts he had a short career in B-movies like Showdown (1993). Roddy Piper - a pro-wrestler, best known for appearing in John Carpenter's They Live (1988). Any gore or violence ? Some violence, a little blood (more in the uncut version). Who is it for? Fans of DTV action films should enjoy this. Other regions? The UK Hollywood DVD release of this film includes the fully uncut print. Also available in Germany, cut status unknown. Cuts? This is a cut print, missing around two minutes of fight scenes (from about 10 places in the film) with noticable jump cuts. Titles and credits are in English. A great buddy pairing and some enjoyable action scenes make this one that DTV action fans should enjoy. Print and audio are fine, the cut print is a shame although not a deal breaker, the UK Hollywood DVD version does include the fully uncut print if you can find it. All text in this review written by Timothy Young - 17th March 2012.